Creating the perfect real estate business plan will help you achieve and exceed your professional goals. By taking into account current income and fixed expenses, we’ll help you determine how many deals you need to close to reach your financial targets. This article will give you the information and templates you need to map out a winning real estate career. Think of your real estate business plan as GPS for your career. Instead of getting lost and asking for directions, you simply reference your plan and forge ahead. Writing a business plan should be one of the first tasks you undertake in your career. Use software, set your goals and use templates to make it easy. For both agents and brokerages, a business plan is a living document, meaning that you don’t “set it and forget it.” The best real estate business plan is one that evolves with you and one that you continue to tweak and alter things as your business grows. For example, a new agent might start out buying for sale by owner (FSBO) lists and cold calling to get leads, then realize they are more adept at writing Facebook ads. Maybe your greatest strength turns out to be the lead generation strategy you didn’t initially believe you would use. Because there is no right way to succeed in real estate, you would adjust your real estate business plan to fit your new lead generation strategy. When we talk about your real estate business plan as a living document, it simply means that it should evolve as you learn more about what works. As you discover more about your own personal strengths and weaknesses, you will see your business plan change to accommodate that. No matter how your business evolves, LivePlan software can help you maintain your business plan by refreshing your business plan automatically in real time whenever you add new financial data. For agents, a real estate business plan is not only a roadmap to your financial and personal development, but it helps to keep you accountable as well. Putting your goals, and the way to achieve them, down on paper can help keep you on track when you start to second-guess yourself. Because you’ve already run the numbers with your plan, in periods of difficulty you already know exactly what you need to do to pull ahead. Even the best agents in the business have had periods of doubt and uncertainty. Ryan Serhant, of “Million Dollar Listing,” had his first big $14 million listing sit for more than a year without a single offer yet went on to build the second most successful real estate team in New York City. Map out your business, realize there will be setbacks and stick to the plan. Before you start to create a real estate business plan of your own, it always helps to see what others have done successfully. Below you’ll find three examples of effective business plans that you can use by adapting them to your specific business goals. These are just a few examples of the type of structure that LivePlan can offer before you begin with other templates for real estate business plans available as well. Having a template is a game changer as you begin the process of mapping out your business. The ability to build on a proven formula for evaluating and mapping out success in your career puts you at a distinct advantage from the beginning. The executive summary section of your real estate business plan is an example of what you would tell a friend over dinner if they asked you how you planned to make money as a real estate agent, using the above bullet points as a guide. For example, let’s say you’re a former advertising executive planning on working in Manhattan. In your executive summary, you could say that you plan to work in SoHo and focus on doorman rental buildings to start, and then work your way up to luxury co-ops. You might include information on the average rental or sales price, vacancy rate or your connection to the neighborhood. You could then go on to describe how you will use your advertising skills to bring in buyer and seller clients in SoHo utilizing a solid Google AdWords and Facebook ad campaigns. The second step in writing a real estate business plan is to assess the market you plan to work in. In the real estate industry, this is known as your “farm area.” It may sound a little bit silly at first, but it’s an excellent analogy for real estate. By advertising and generating leads, you will be sowing seeds. By converting those leads to clients and closing deals, you will be harvesting your crops. Local demographics: Is the area mostly retired people, tech workers, blue collar workers, young families or another group? Each demographic requires different approaches to lead generation. The competition: How many other agents or brokerages are there in the area? How does your brokerage measure up? Once you’ve written your executive summary and researched your farm area, the next step in writing a real estate business plan is to outline your lead generation and nurturing strategy. 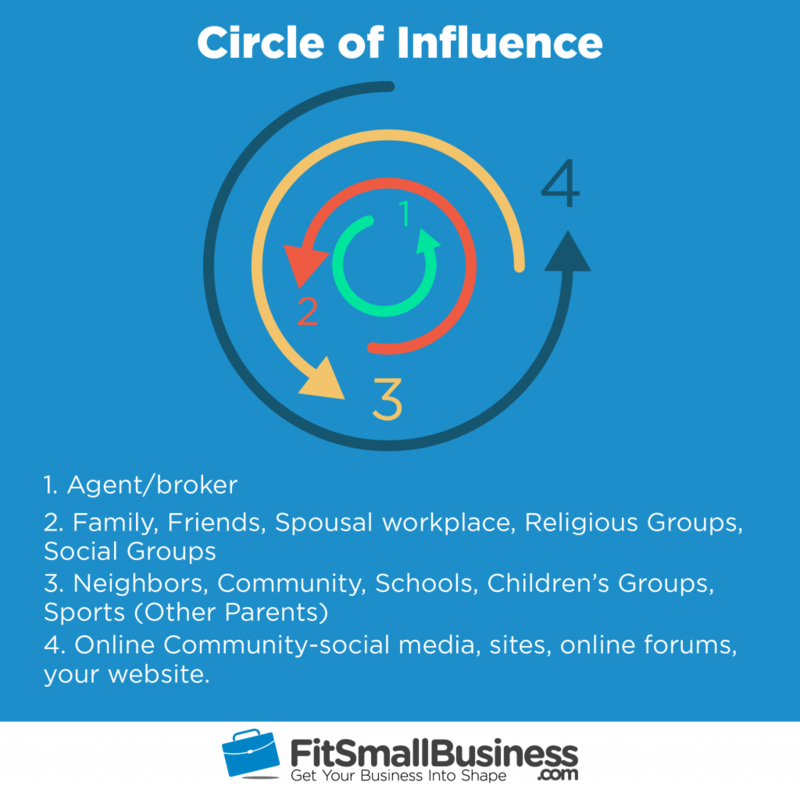 New agents should generally start out by marketing to their sphere, or circle, of influence. Your circle of influence is the people you know who you have some kind of influence with. Your friends, family, former co-workers and business associates are all in your circle. Your goal is simply to inform them you are working as a real estate agent and to offer your services to them. Calling is generally the best way to reach out to your circle as it’s the most personal, but you can also use email, social media sites and any online forums of which you are a member. Your next step is going to depend on the demographics of your farm area and your skill set. Because there are so many lead generation ideas from which to choose, have a look at our list of the top 47 lead generation strategies to get an idea of what will work for you and take notes as to which you would like to focus on. Certain demographics respond best to specific approaches. For example, if your farm area is largely retirees, you may decide to generate leads with cold calling FSBOs and use a service like ProspectsPLUS! for a postcard or door hanger campaign. If your farm area is largely young tech workers, you might have better luck with Facebook advertising and a solid social media presence on Instagram. In this market, more people are using Facebook through a number of demographics so be sure to see our Facebook for Realtors guide to get yourself up to speed. If you’re looking for a way to quickly build a list, try a lead generation tool like BoldLeads. It offers exclusive seller leads to ensure that only one agent (you) gets leads from a single zip code. With a robust CRM and marketing automation tools, BoldLeads is an end-to-end real estate marketing funnel that helps agents save time, qualify leads, and drive more sales. Claim your zip code today. The next step is to work on a realistic financial plan to determine and reach your goals. To set accurate financial goals in your real estate business plan, you have to understand your expenses. Although this may sound intimidating, it’s actually very simple. Here’s what you need to do. You cannot accurately create business fiscal goals without knowing what your personal expenses are that you need to cover. Your real estate business plan needs to, at a minimum, cover your cost of living, so this is something that must be tallied carefully. Be sure to have a detailed list of your living expenses (from utility bills to gasoline for your car), and know how much you have to make to cover these expenses. Also include your personal goals, which can be anything from saving up for a better apartment (with a specific dollar amount) to a down payment on your own investment property (including dollar amount). Integrate these as part of your overall business plan, considering the fiscal goals you will have to meet to attain them. If you don’t already use a tool like YNAB to examine your personal budget, be sure to integrate this into your life to make these questions easy as your career and living conditions continue to evolve. YNAB tracks every aspect of your personal finance from vehicle maintenance to holiday gifts. Know an exact number of how much money you need to make in covering your personal financial obligations and basic living expenses every month. Because you already know the average rental or selling price in your farm area, this one is pretty easy. Just take the average transaction side (one half of a real estate commission earned representing either the buyer or the seller), which is generally 3 percent, and determine how many deals you will need to close to break even and how many deals you need to close to reach your goal. For example, let’s say your financial goal is to make $50,000 your first year and you have $5,000 in yearly expenses. If the average transaction side is $10,000 in your farm area, on a 50/50 split you will make $5,000 from a typical transaction before expenses. That means you will need to close 11 deals in your first year in order to bring home $50,000 in net annual profit. Admittedly the math can get a bit fuzzy here, but you should plan on closing roughly one in every 30 or so leads that you generate. When we say leads here, we mean warm leads (like people who are actively looking to purchase or sell a home). You will probably need to generate more cold leads, people who are a few months away from purchasing or selling a home, in order to generate 30 warm leads. Using software provides the structure for your real estate business plan, so you can focus on the details. LivePlan is the software we recommend highly that you use to write your business plan and is the software we personally use. The software includes an array of templates for real estate agents and offers an incredible amount of features that help to keep your business plan flexible as you grow in your career. The features that we particularly like about LivePlan that make it an essential for us? It is simple to use, shows patterns over time (if you are hitting or missing goals) and allows us to adjust our plan on the fly. For example, it gives you financial calculators so that if you add or remove an expense, it changes your targets automatically. If you’re not using some kind of software, you are creating more work for yourself. If you want to make your real estate business plan easier to write and update, you should consider using business plan software. Business plan software will not only produce a professional looking document but also help the writing process by prompting you to answer simple questions about your business. Writing a solid real estate business plan is the best way for new agents figure out how they plan to succeed in their first year and beyond. In order to write an effective plan, you need to assess your farm area, develop a lead generation and nurturing strategy and come up with a solid financial plan to reach your goals. One of the most important things you can do as a new real estate agent is to be sure that you are maximizing your exposure and your lead generation strategies. BoldLeads can help you quickly build a list of exclusive leads in your zip code for just $6-$20 per lead. You also get training videos and webinars, a CRM, and pre-written drip campaigns for nurturing cold leads with emails. Click here to claim your zip code. This is great, for it will help me to focus on what I really need to do. I feel like I am all over the place, for I just wanted some guidance. Organizing your plans is one of the most important steps to your success. Best of luck! Wow this is a good site.it will assist me in writing My Business Plan in Starting My Real Estate Business. Thanks.